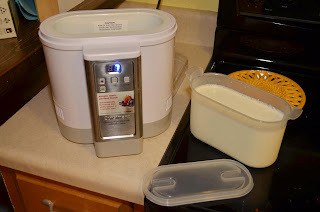 My wife an I love yogurt but we go through so much of it we were looking for a way to save some money. We found a sale on this one and figured we'd give it a shot. In short; we couldn't have imagined it would be this easy to have yogurt every morning. There's definitely not only one way to prepare a recipe but we found the simplest was to use whole milk and a cup of Oikos Greek yogurt. Mix it up, put it in, and start the machine. The big selling point for us was the self cooling feature. 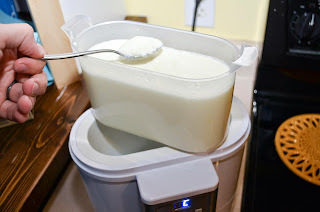 Many yogurt makers, as well as manual methods of creating yogurt, do the process over a certain amount of time, but then require you to be paying attention and put it in the fridge. We're both somewhat forgetful so this made it so much easier. After it has done the requisite amount of cooking it automatically goes into cool mode. It will stay there until you come back and is ready right away. This makes it perfect for last minute overnight breakfast preparation. If you're looking for a machine that lets you put the smallest amount of prep work into it and be able to wake up to finished yogurt in the morning, ready to eat out of the container, this is for you. Mix in a spoonful of strawberry jam and it's heaven.